It was a solitary little girl, mimicking with sinister skill the voices of her dolls, that first lured Sarah into the Foster household. Intrigued by Jennie’s serious nature, she became her governess for the winter and soon found herself inextricably trapped in the stifling atmosphere of intrigue and suspicion that surrounded the family in the big Kensington house – a house already witness to one ‘accidental’ death, which left lingering fears and doubts among its remaining members. But Sarah, not knowing who to trust and suppressing her mounting terror, is forced to follow the issue through to its sinister conclusion. Written by Dorothy Eden. This Coronet Edition second impression 1972. 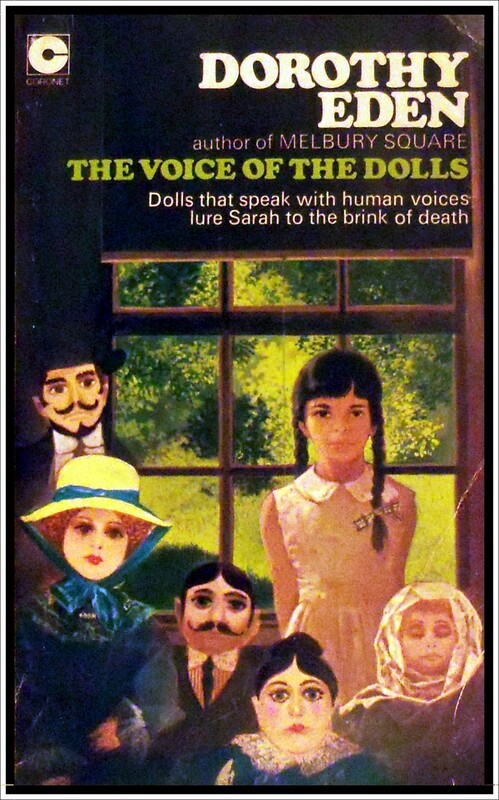 I have already reviewed Voice of the Dolls in an earlier post but I had to share this slightly earlier edition with its all too eerie artwork. If scary, starey dolls didn’t frighten you before, then this cover should change all that. Definitely not a portrait you’d feel comfortable turning your back on! Sarah was first lured into the Foster household by her concern for Jennie. She had overheard the little girl exercising her extraordinary talent for mimicking the voices of her dolls. Since Sarah was looking for a job at the time, she was glad to become Jennie’s governess for the winter. But that was only the beginning. Soon she too was trapped in the stifling atmosphere of intrigue and suspicion engulfing the house. One ‘accidental’ death had already disturbed the peace. Was there to be another? Written by Dorothy Eden. First published 1950 by Hodder & Stoughton. This edition published by Coronet 1978. Dorothy Eden was a new Zealand author, best known for her historical, suspense and gothic novels. I have a few of her gothics and thought it high time I gave one of them a go. Voice of the Dolls tells the familiar tale about a young governess, Sarah Stacey, coming to work for a family of eccentric characters, only to find herself embroiled in murder, mystery and attempts on her life. Sarah’s charge is Jennie – a young, withdrawn girl who spends most of her time playing with her own ‘family’ of creepy dolls. Sarah is determined to win her over and bring her out of her shell, but things are not helped by the brooding atmosphere in the house. When Jennie’s maudlin father, Eliot, hangs himself, all of Sarah’s instincts tell her to flee, but her love for the child makes her stay – in order to solve the mystery behind the awful secret harboured within this strange family. I thought this gothic started out well, Dorothy Eden is good at writing descriptions and building suspense. The ending was quite good too. Unfortunately the story seemed to grind to a halt about a third of the way in and I found the middle of the book a little difficult to get through. Apart from the odd suicide and a cook who likes to foresee the future by reading tea leaves, there isn’t a lot happening for much of the book and I found the pace a little slow. Written in 1950, this is one of Dorothy Eden’s earlier attempts in this genre. Though this book didn’t impress me too much, I like her prose style enough to try one of her later novels, so watch this space. Two out of five stars. 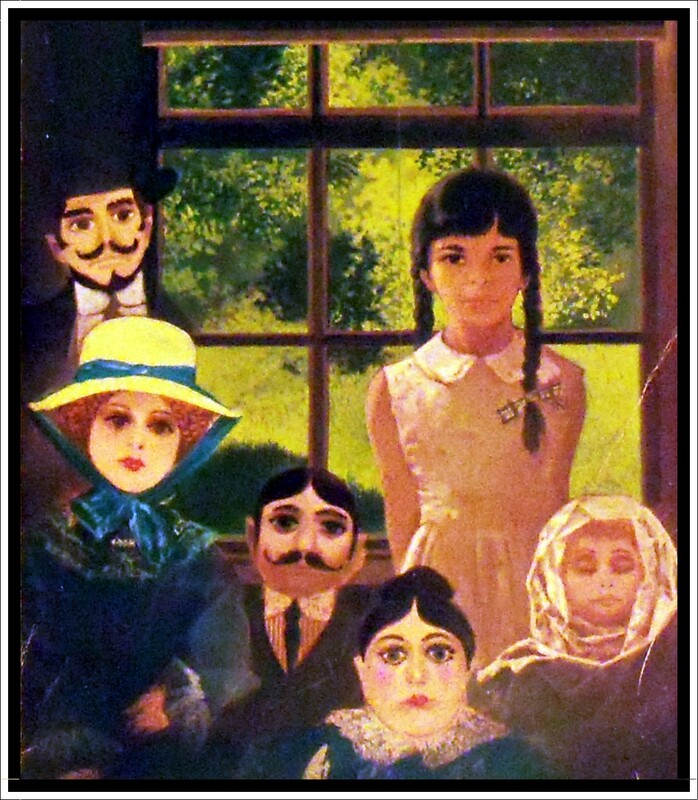 And there is another review of Voice of the Dolls, with an example of some great cover art, over at the wonderful Gothicked blog HERE.